Each year, the United States Army, Europe (USAREUR) undertakes a conference-study program on a matter of strategic significance, with several objectives. The topic relates to USAREUR’s mission; anticipates future requirements; contributes toward building democratic norms within the militaries of emerging democracies; and serves to inform the USAREUR staff, higher headquarters and other U.S. Government agencies of active measures to improve current practices. Examples of topics in the last several years are Preventive Diplomacy, Planning and Conducting Large Scale Emergency Operations, and Military Support to Democratization in Europe. 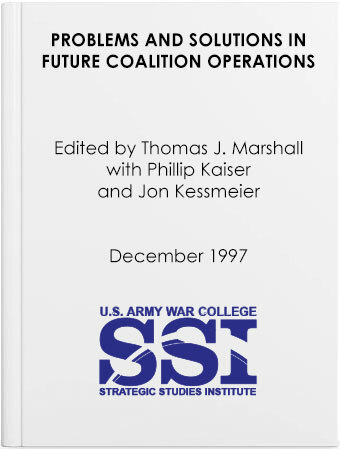 In 1996, USAREUR undertook to study “Problems and Solutions in Future Coalition Operations.” That topic was germane not only because of the U.S. Government’s participation in several current coalitions, but also because USAREUR will continue to be in the vanguard, participating in a wide variety of multinational operations. While coalitions may be a way of life for most militaries, changes in the geostrategic environment over the past several years have created new challenges and opportunities for U.S. participation. Protecting the Kurds in Iraq after the Gulf War, supporting humanitarian relief operations in Rwanda, deploying a preventive diplomacy force to the Former Yugoslav Republic of Macedonia to guard against a spillover of the Balkan conflict, and providing forces to support the implementation of the Dayton Accords for Bosnia have tested the United States’ ability to work with new partners, in support of new missions, in unfamiliar parts of the world.